Crab is notable even among other crustaceans for its sweet flavor, and Alaskan king crab is superlative even by crab standards. It's typically sold precooked and frozen, because the stormy and dangerous waters where it's harvested are too far from major markets for the fresh product to be practical. When thawed, whether at home or at the market, it's highly perishable. If you can't eat it immediately, you can refreeze the crab, but only within some severe limitations. The problem with fresh crabs in general is that they don't live long after they're harvested, and they begin to deteriorate rapidly when they die. To capture their flavor at its absolute best and freshest, most processors steam and blast-freeze the crabs either on the boat itself or in a processing plant as soon as the boats land. That rapid freezing process is critical because the fluids inside the crabs' muscles form crystals when they freeze, expanding just like a regular ice cube in its tray. This can rupture the cell walls in the crab legs, taking away texture and moisture. Fast freezing makes smaller crystals, minimizing physical damage to the crab meat. If you're going to keep the option of refreezing your crab, thawing it safely is absolutely critical. Don't thaw them at room temperature, or in a water bath. The only safe way to thaw them for refreezing is in the refrigerator, where they won't reach an unsafe temperature at any point in the process. 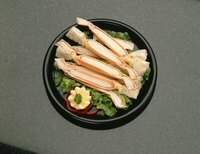 The shelf life of thawed crab legs is three days or less, so don't thaw the legs until the day you plan to cook them. If your plans change, refreeze the crab immediately to preserve its shelf life to the greatest degree possible. If you've bought the crab already thawed from a store, check the packing date. If it's not dated for the same day, use the crab or discard it -- don't refreeze it. Aside from its unusual perishability, refrozen crab poses a serious question of quality. The initial freezing process took place in a commercial blast freezer, which causes relatively little damage to the flesh, but your own home freezer doesn't work as quickly. When you refreeze king crab, the crystals formed in the meat are larger and cause more rupturing within the cell walls. This will soften the texture of the flesh, and the additional moisture can leave the crab drier in texture than it was after the first thawing. This is why Alaska's Seafood Marketing Institute advises against refreezing crab legs. However, you can counter the quality issue by being creative in how you use the legs after you thaw them again. Always mark the packages of refrozen crab so you know what you're working with. If you still wish to serve the legs in their shells, consider cooking them directly from the freezer. You'll need to extend their reheating time by a few minutes, but eliminating that thawing stage improves food safety and preserves some of the crab's quality. Alternatively, thaw the legs safely in your refrigerator and add the meat to your favorite chowder, sauce, risotto or pasta dish just before it's finished. Combining the crab meat with a sauce masks any loss of moisture, and providing contrasting textures such as rice or pasta helps distract from any deficiencies in the crab's texture.